In addition to hosting wedding receptions, we also host bridal showers at our banquet hall throughout the year. In fact, we recently held a Hawaiian themed bridal shower for a couple who plans to get married in the ‘Aloha State’ later this year. Our famous Celebrity Room was transformed into a paradise, with coral bows and pink napkins. The soon-to-be bride and groom also brought in beautiful tropical centerpieces. 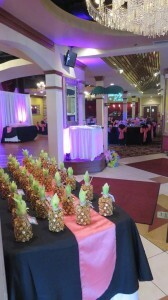 a palm tree, leis and pineapple favors for the guests to take home. To keep up with the theme, executive chef Michael Kitchen III also prepared a delicious white and coral cake and prepared a bright and colorful fruit plate for guests to enjoy. 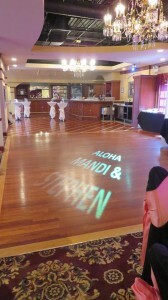 We also had an aloha message displayed in lights on the dance floor. With all events that we host, our packages make it easy on the host or hostess– all you have to do it show up! Overall, our shower package includes a skirted head table, skirted gift table, silk floral centerpieces, silver plate table settings and unlimited soda and non-alcoholic punch. Guests will also never leave hungry due to the fact that the meal consists of a chicken or combination entrée with your choice of soup, salad, potato, vegetable and dessert. If you are looking to host a wedding show at Martinique Banquets, you can read more about our shower package here. We also invite you to come to our banquet complex to talk to you about your special event in more detail and provide you with a tour of our Grand Ballroom and Celebrity room. 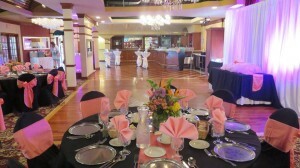 To set up an appointment, you can call our office at 708-424-1776 or email info@martiniquebanquets.com. We are more than happy to help provide you with a personalized and memorable event. This entry was posted in celebrity ballroom and tagged bridal shower chicago, Chicago Banquet Hall, Chicago Event Space, Martinique Banquets, martinique banquets cicero, Martinique Burbank, Martinique Celebrity Room, martinique grand ballroom, themed bridal shower by admin. Bookmark the permalink.